Pasta is a type of noodle originally from Italy typically made from durum wheat and water or eggs. Pasta can be of different shapes and cooked by boiling in water . Now a days most products found as pasta are made from common wheat. Pasta can be cooked in many different ways. 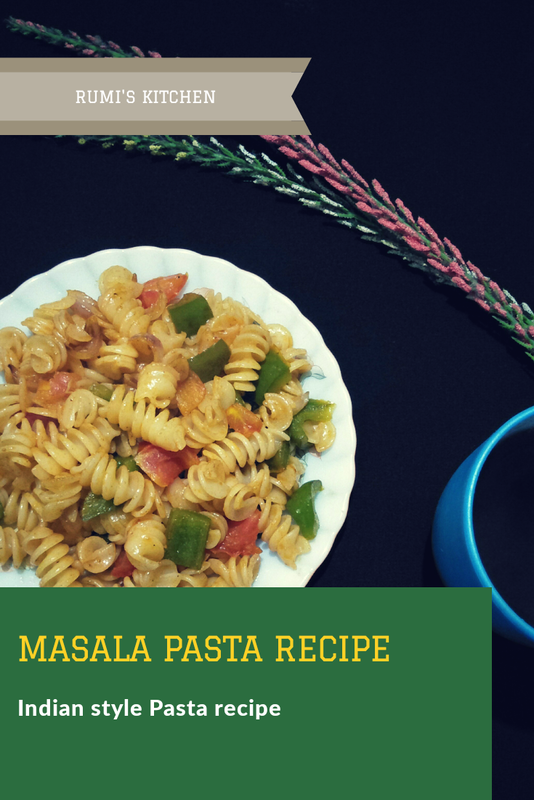 Masala pasta recipe is an Indian style pasta recipe cooked with different Indian spices. It's a very easy and simple recipe that can be prepared in just no time. 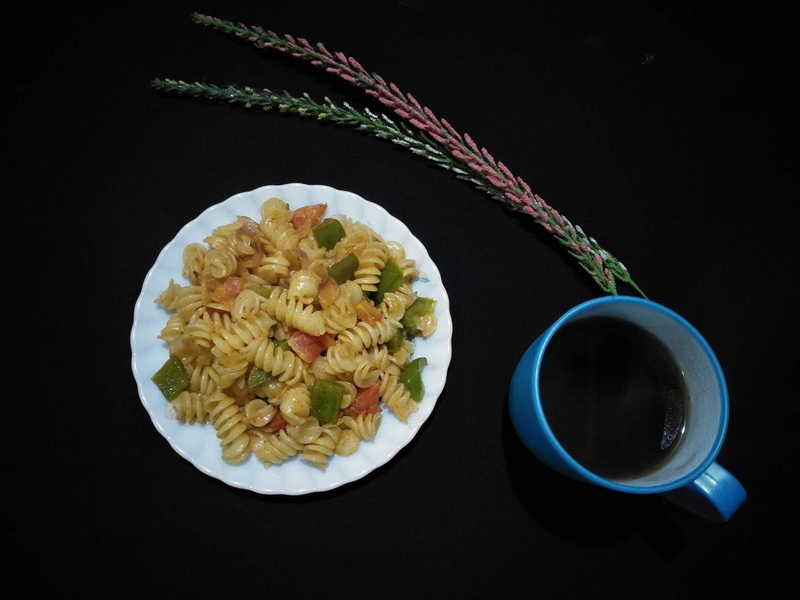 Serve this recipe at breakfast or pack it in your kid's school tiffin box. Boil pasta in 3 cups of water. Add pinch of salt and few drops of oil. Drain and wash under running water . Keep aside. Make slices of onion, tomato and capsicum. Keep aside. Here you may also use other vegetables like carrot, beans etc. In a pan heat oil. Add chopped onions and fry till translucent. Add chopped tomatoes and fry till oil separates. Add cumin powder, coriander powder, red chilli powder and garam masala. Mix well. Now add onion, tomato and capsicum slices. Mix well. Add salt and cook for few minutes. Add boiled pasta. Mix well with the veggies and masala. Now add tomato sauce and chilli sauce. Mix well. Remove from heat. Thanks for sharing a such a good and tasty recipe of Masala past which i used to cook but your is bit different way of cooking i will try this....., keep sharing such a new and interesting recipes. Easy yummy and delicious recipe for the sudden demand of pasta from from my Son. Bottle gourd is also known as lauki in Hindi and lau in Assamese, is a versatile vegetable that contains almost 96% of water. Bottle gourd is perfect for juice extraction but it is used in making many different recipes in Indian cuisine. Bottle gourd pakoras, kofta curry, sabji, halwa, thepla are some of the famous bottle gourd recipes of Indian cuisine. Bottle gourd kofta curry or Lauki kofta curry is a light tomato based spicy curry dunked with koftas made from bottle gourd. Now what is kofta ? Well a Kofta is a savory ball made from minced meat or vegetables. Bottle gourd is one of my personal favorite vegetable and I often make simple bottle gourd sabji or sometimes fish curry with bottle gourd. I become lazy these days in doing experiments in my kitchen because of taking care of my two little kids. I had a small piece of bottle gourd laying in the refrigerator and I was bored eating the same bottle gourd sabji recipe. So I decided to cook bottle gourd kofta curry. Every cook has their favorite pieces of kitchen tools. Knife is the most important tool of every cook's life. A cook can use his favorite knife in his desired way. Choosing a good knife may be sometimes very difficult. Sometimes a knife may look good but it may be not good in use. The most important thing while choosing a good knife is that you must feel comfortable while using it. It needs to be sharp and easy to be sharpen. Tai Khamyangs are popularly known as Nora. As many Khamyangs historically used 'Shyam' as their surname, so Tai Khamyangs are also popularity known as Shyam. Tai Khamyang is a subgroup of the greater Tai community of Assam. They are numerically a small group of indigenous Assamese community. The word 'Khamyang' is a Tai word which means 'having gold'. 'Kham' means - gold and 'yang' means - to have. Tai Khamyangs are Buddhist by religion and are found in Sivsagar, Tinsukia, Golaghat and Jorhat Districts of Assam and in few places of Arunachal Pradesh. Assamese cuisine is known for its simplicity. Use of less spices makes it very healthy. Here I'm going to share a simple fish curry recipe where no powdered spices are used. Fish curry with taro root and thai basil is a simple fish curry recipe. Taro or colocasia is a tropical plant grows all over Assam. In Assamese it is called 'kosu'. The leaves, flowers, stems and roots of a taro plant are all edible. For making this fish curry I am using the root part. Thai basil or lemon basil is available in few parts of Assam and few communities of Assam used it as a cooking ingredient. It has a real citrus like smell and taste. But if you don't have thai basil you can use any other basil or use coriander leaves.